What else can I say? Time and time again, President-elect Donald Trump proved me wrong over the past 18 months and he did so again last night in historical fashion. I doubted he would make a serious push for the presidency, doubted he would win the Republican primary, and doubted he would hang with Hillary Clinton throughout the general election campaign. And, on the eve of election day, I doubted he would even come close to making the final tally respectable. Last night, he shut me up for good. Congratulations to Donald Trump on defying the odds, overcoming countless obstacles, and winning the highest office in the land. Although I questioned him and called him out, I can’t take away the grit, talent, and the determination that man has. I love behind the scenes photos. 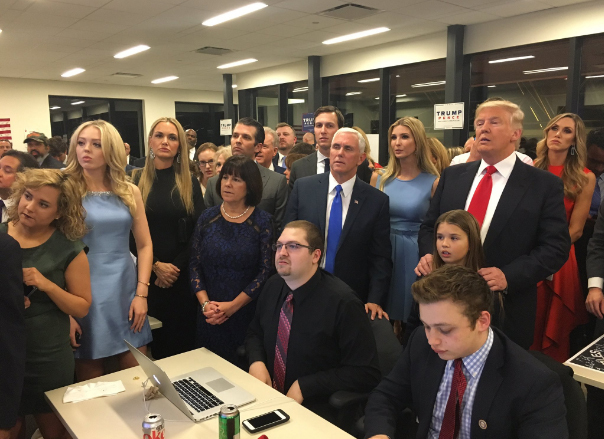 Seeing this glimpse of the Trump camp watching the election returns was pretty cool. I got a little more than I bargained for last night. As someone who never obsessively latched onto a candidate, I wanted to see at least a tiny bit of drama unfold as the votes rolled in. You know how a football fan who has no interest in the teams playing in the Super Bowl wishes only for a good game? Well, much in the same way, last night I wanted to see a competitive race in what was supposed to be a runaway. What I got was the most unpredictable, surprising, underdog victory in political history. Watching the coverage last night, I kept asking myself is this really happening? As I watched the surprising results unfold and monitored the social media chatter, I could actually sense inside of me the air deflating from the Clinton camp and the confidence rising in the Trump camp. Yes, what occurred was so surreal and unexpected that I could feel the shift inside of me. I went to bed at 1:30 a.m. last night, about an hour before the media projected Trump would win the presidency but a couple hours or so after the writing was on the wall. 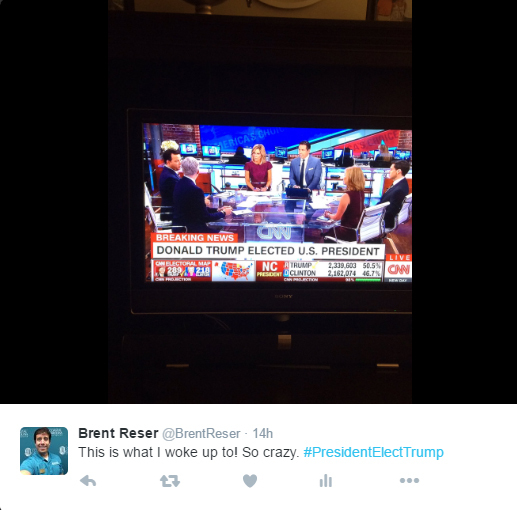 When I awoke this morning, I turned on the TV and the ticker on CNN boldly proclaimed DONALD TRUMP ELECTED U.S. PRESIDENT. At that moment, the reality sunk in. I woke up this morning and took this photo of my TV screen. Even though I went to bed with Trump having the election in the bag, it was still shocking waking up to the news. 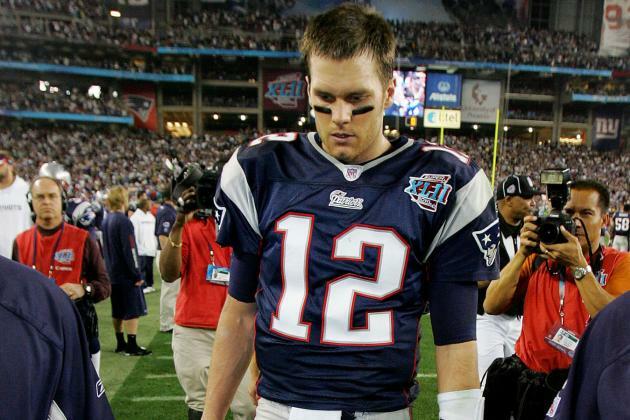 The upset of Hillary Clinton and the Democratic Party reminded me of the upset of Tom Brady and the New England Patriots in 2008. When I saw this morning that Donald Trump had won the presidency, it reminded me a little bit of when the Giants beat the Patriots 17-14 to win the 2008 NFL title. Despite a media desperate to crown its own champion along with fancy statistical models seemingly backing up the anointed choice, the exact opposite happened in both cases. I think the national media can do a better, less biased job. I think the constant polls that are shoved down our throats can be less frequent and much more scientific. Along with myself, I blame the media and polling professionals for getting this all so wrong. Disappointed with a Trump presidency? That is fine, but please remember to express yourself in a civil way. In anticipation for this bitter election, I wrote a full eight months ago about the road we should never travel if our preferred candidate is not elected. It is time to heal and it is time to support the person we elected as president. What a saga it was. Don’t Blink.